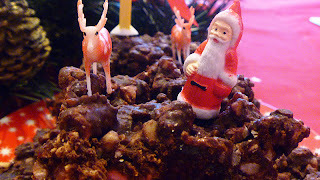 A few years ago I received the Nigella Christmas recipe book for Christmas. This has since become my "Christmas Bible". I love the pictures and the recipes inside and although I suspect that Nigella may not be dressed in candy striped pyjamas smiling serenely whilst clutching her "Keep Calm and Carry On" mug come Christmas morning, I must admit that some of the recipes are pretty tasty - even if they are re-hashed workings of other recipes. In my opinion, it's nice to have all the recipes in one place and it's lovely to sit down at the start of December and have a read of this book - it really gets you in the mood for Christmas! Over the festive period I always make this Christmas Rocky Road Cake which is featured in the book. We tend to substitute the brazil nuts for chopped nuts because the children are not big nut fans and so I sneak the nuts in to the dish and hope that they don't notice them! 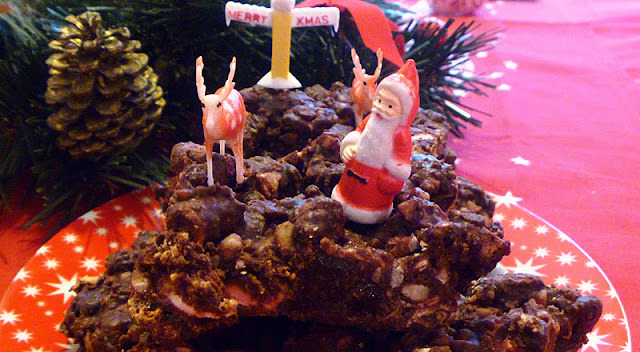 This does give the rocky road a different texture, but for me doesn't alter the taste too much. 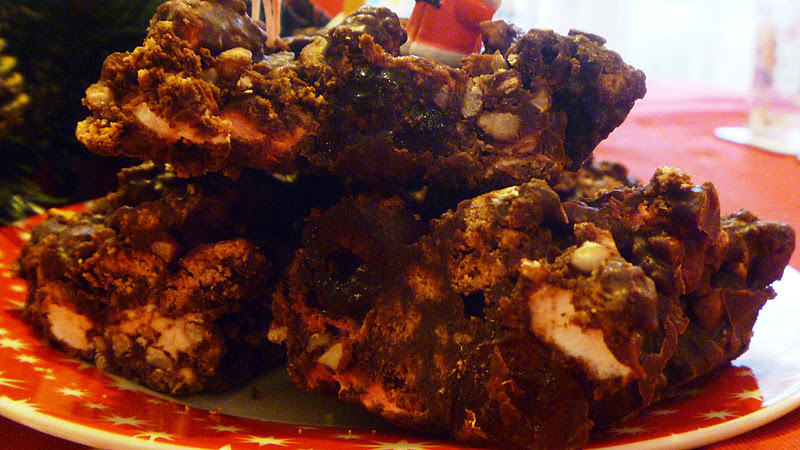 This version of Rocky Road really does have Christmas all wrapped up - the amaretti biscuits, combined with the chocolate, cherries, marshmallows and nuts are just so delicious and will leave you wanting more. 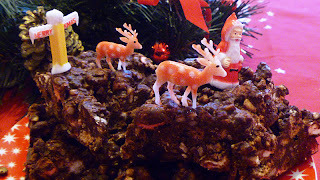 This is a great recipe to make at Christmas time and throughout the year! Break the chocolate into small pieces and melt over a gentle heat in a heavy-based pan, along with the butter and syrup. Place the biscuits in a freezer bag (or keep in original packaging) and hit with a rolling pin to create different sized pieces. 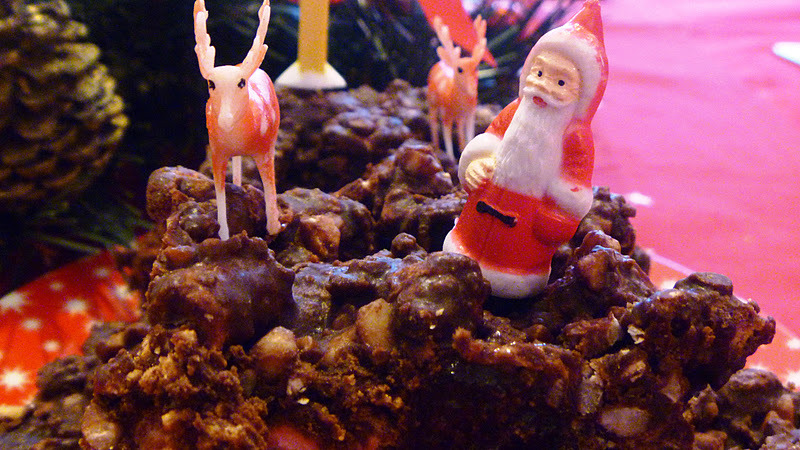 Remove the pan from the heat, and add the crushed biscuits, nuts, cherries and mini marshmallows. Stir carefully to ensure that everything combines well with the chocolate. Turn the mixture out into a pre-lined baking tin, or tin foil case. Smooth the top over as well as possible. Place in the refrigerator and leave until the mixture is set and firm to touch (generally, this takes around two hours). Remove from the foil tray or baking tin and cut into even pieces (Tip - I would cut the into smaller, bite sized pieces as they are extremely rich!). Decorate with icing sugar or edible glitter if desired.